Very recently my sister shared with me a beautiful New York Times opinion piece titled 'Our Mothers As We Never Saw Them'. The author became interested in contemplating the photos of women before they were mothers. Gazing at these young faces and beautiful bodies, so bright and innocent, made me feel weepy. Why are their images deeply touching and what can they tell us about motherhood? I think becoming a mother teaches us the responsibility of holding life and death in our hands. We learn that hard adult lesson: we are not in control. We learn unconditional love on the delivery table. And when we grow up and care for our own mothers, we begin to see them not as simply our mothers, but as people who are frail, mortal, unique and whole. Our young selves could never imagine that a husband would die young of a stroke or that a child would be born with cerebral palsy. Our young selves cannot know how much love, care and hurt is in a mother-heart. This Mother's Day, I give myself this photo of my Mom before my sister and me. In her direct gaze, I can see her grit and determination. And to me, it looks as if she's thinking of what to say - Mom never shies away from offering an opinion. 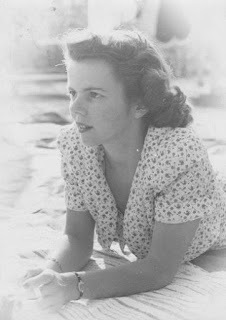 A child of the depression and the war, I imagine my mother is thinking, "You got a challenge? Bring it on." And I give our daughter and our son this photo of me before I had them. 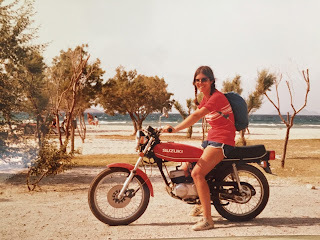 This was a summer holiday that Jim and I took in the Greek island of Kos. The year was 1979 - I was 24 and full of optimism and curiosity about life and adventure. Through all the children, the love, the pain of loss and the work of caring, we really haven't changed much, have we? We've been here all this time. Happy Mother's Day!